The Star Ferry is THE Hong Kong Ferry, one of the beloved icons of the city and a lot more than just a means of transportation. 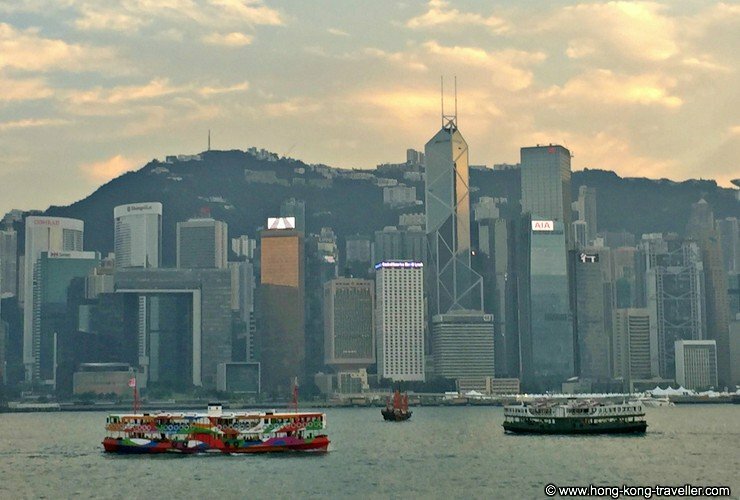 It has been shuttling residents between Hong Kong Island and Kowloon in the mainland for over 120 years. Up to 1978 when the Cross-Harbour Tunnel opened, it was the only way to cross the harbour. For visitors, besides being a very convenient way to get around, the clunky double-deckers offer one of the world's most spectacular views, all for less than a dollar a ride. There are around twelve distinct green and white vessels in operation with some dating from the 1950's and 1960's. 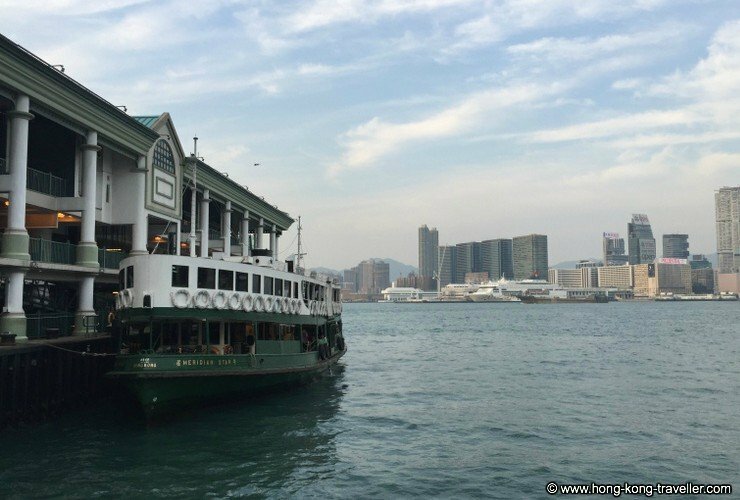 With names like "Shining Star" and "Celestial Star" the Star Ferries traverse the waters of Victoria Harbour every day, you can count on one leaving every 10-12 minutes. There used to be a route to/from Hung Hom in the Kowloon side but as of April 2011 it has been discontinued. NEW! You can now get to Hong Kong Disneyland with the Star Ferry! Leave from Tsim Sha Tsui Ferry Pier and arrive at the Disneyland Resort Pier 45 minutes later. More info here. 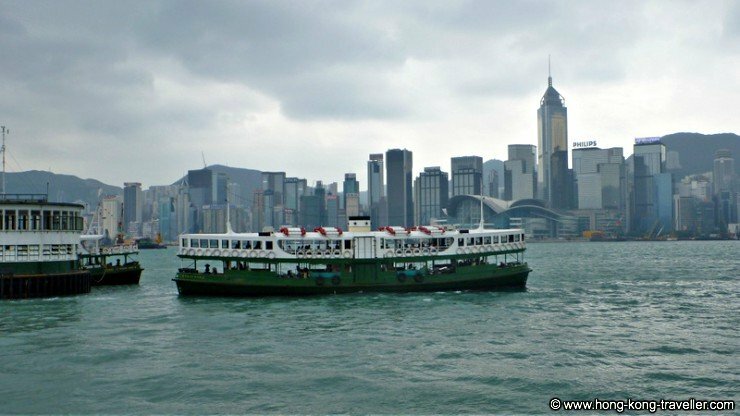 The most popular route is the Tsim Sha Tsui-Central route, and most spectacular in exactly that direction. 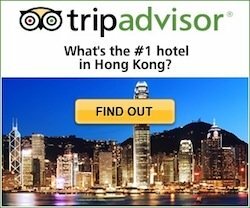 Take it on a a clear night or at the twilight hours and you will never forget the sight as you approach the arresting skyline all lit up and magnificent Victoria Peak in the background. 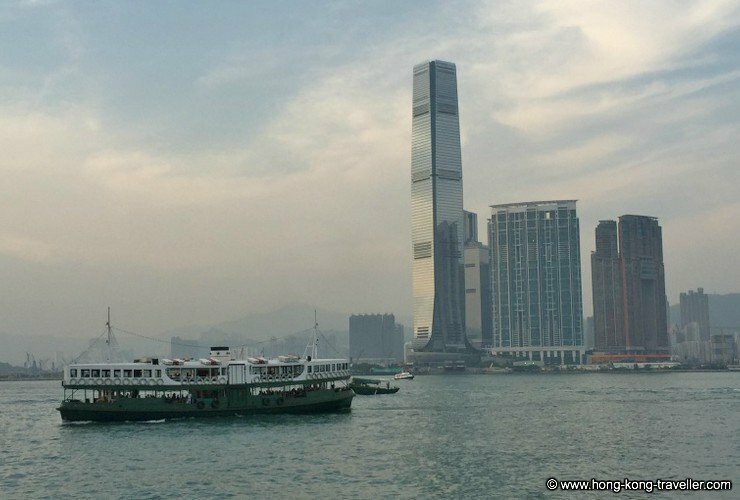 Hong Kong ferries start running at 6:30a.m. on the Central-TST route, and at 7:20 on the Wanchai route. They leave at intervals of approximately 10 minutes, a bit more often during the morning and afternoon rush hour and rides take just under 10 minutes. The last ferries leave at 11:30 p.m. on the Central route, and at 10:50 p.m. on the Wanchai route. There are different fares for the upper/lower decks, and also for Adults, Children (3-12 years) and Seniors (65+). The basic Adult rate for the upper deck (highly recommended for best views) is only HK$2.70, at less than US$0.35 a definite bargain. This is slightly higher on weekends and holidays. You will need exact change for the turnstiles, or you can also use the handy Octopus Card, which we recommend you get to avoid lines at the ticket counters and can be used on all sorts of public transportation throughout Hong Kong. 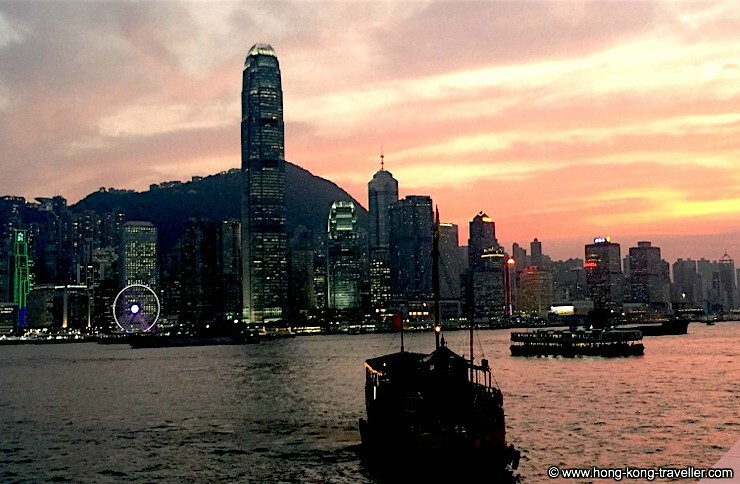 A Victoria Harbour Cruise is certainly a "must" experience while in Hong Kong. 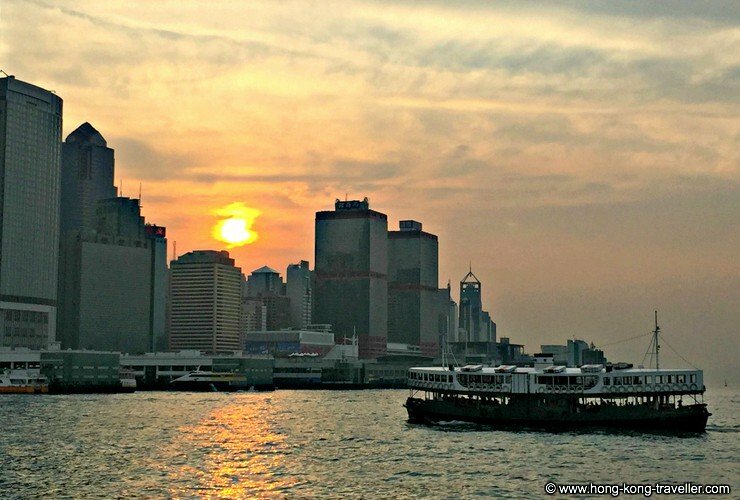 Although you see much of the stunning harbour during a regular Hong Kong Ferry ride which lasts just under 10 minutes, the Star Ferry fleet also offers a circular one-hour sightseeing Harbour Cruise aboard the "Shining Star", great for a break in between the day or to cap the night with the sparkling skyline in the background, an awesome treat. Star Ferry Harbour Cruises depart from Tsim Sha Tsui and Central and can now be booked in advance via Klook.com and get a small discount. 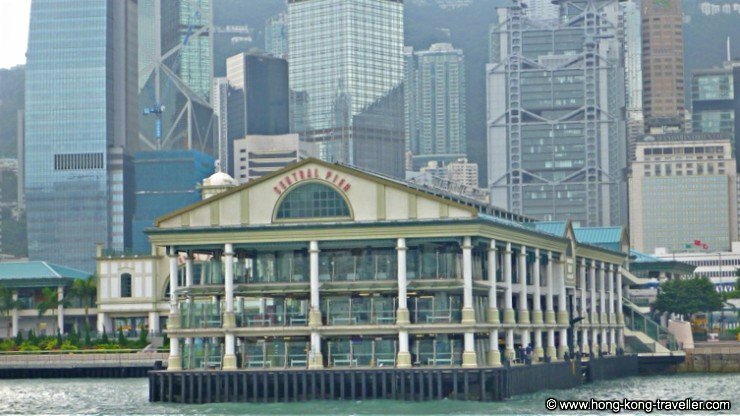 Price for the Star Ferry One Hour Harbour Cruise is HK$100 (at approximately US$12, your best bet compared to other harbour tours) for a day tour, HK$180 for a night tour. There is also a Symphony of Lights Harbour Cruise which departs from the Tsim Sha Tsui Pier at 7:25 pm and costs HK$205. You get to experience the entire spectacle of lights right from the middle of it all as it happens all around you along both the Kowloon and Hong Kong Island shorelines. The Star Ferry Harbour Cruises include a light refreshment. There is also somewhat of a taped commentary that is hard to listen to, so better just sit back, relax, enjoy the ride and the breathtaking vistas. Rates are slightly higher during holiday periods.